It’s time to come out of hibernation and embrace the longer days, warm beach vibes and a beautiful change of the seasons. There is so much to love about Spring in Byron Bay. We have rounded up the top experiences and things to do in Byron Bay this Spring, including some great new restaurants and hidden gems that we’d love to share. Eat – Lightyears Byron Bay Fragrant, fresh and unique this Vietnamese eatery offers beautiful reimagined and traditional Vietnamese fare. Everything from traditional Pho to more modern interpretations, the eatery is a locals favorite, and also offers many Vegetarian options. Complimented by a stellar cocktail and wine list this eatery offers a little bit of something for everyone. Shop - Nikau Store in Byron Bay is a unique and eclectic emporium with that will delight botanical and homeware enthusiasts. Think slow living, hand crafted artisan homewares made with love. The perfect spot for some retail therapy. Play - When thinking of the perfect day out, we can’t go past one of our favorite destinational experiences, Crystal Castle. Home to some of the biggest and most beautiful crystals. 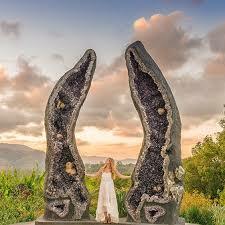 Experience beautiful gardens, meditative walks and marvel at the largest stone blessing Buddha in Australia. Crystals are an integral part of Cape Byron Retreat's design. But their value to guests goes far beyond their shimmering beauty. Fresh, organic and delicious produce grown locally is available each week at Byron Bay's Farmers' Markets. Find out more, including where to find them. Golden sand, dream-like surfing and shimmering water - Byron Bay's beaches are one of the destination's most-loved attractions. Discover the best of them here.